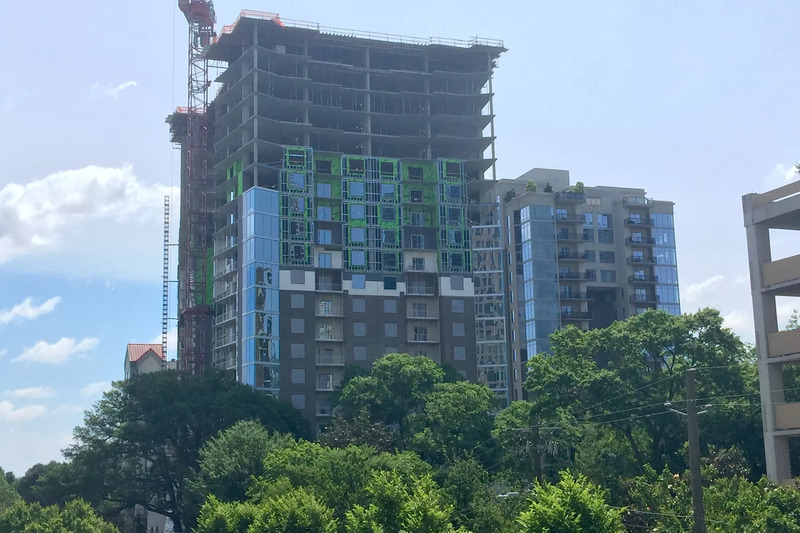 A Midtown apartment tower that developers are promoting as the poshest in Atlanta has reached its max height. Today, the Trillist Companies commemorated the topping out of YOO on the Park, a 25-story tower on 13th Street that overlooks Piedmont Park. The project broke ground in February last year. Officials said pre-leasing for the YOO apartments should begin this July, and residents are expected to be occupying its swanky interiors by the fall. The project joins a flurry of multifamily rental developments in Midtown, but Trillist officials sound confident the refinement of YOO will set it apart. “YOO on the Park offers a level of style, sophistication, and refined luxury that is unmatched by any other building in the marketplace,” Scott L. Leventhal, Trillist Companies President and CEO, said in a release. Aspects such as “exceptional service, next-generation technology, elegant design, spectacular views of Piedmont Park, and world-class amenities consistent with great international cities” will make YOO distinctive, Leventhal said. One finished, YOO will offer 245 apartments, ranging from 540-square-foot studios to two-bedroom units with 1,923 square feet. (No word on pricing yet). Also, expect a dab of retail (1,030 square feet) at the street. Beyond balcony views to Midtown, Buckhead, and downtown, the building will boast a saline pool, cabinetry imported from Milan, in-unit 1-gigabit Wi-Fi and fiber connectivity, an outdoor yoga terrace, and a signature Fido-pampering service called Pet Respite℠. Read original article on Curbed.